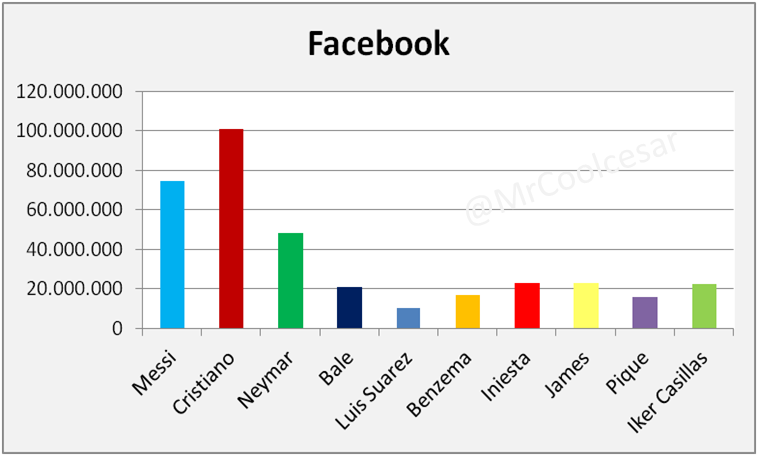 Coinciding with great “El Clásico” in season 2014 – 2015, which is likely to face those who are the 6 best strikers in the world, I wanted to gather information about them as their personal brand is concerned. BBC (Benzemá, Bale & Cristiano) against still no named Suarez, Neymar & Messi. I think the key for the match is on the team, so i´ve included some of spanish players, who are the best in their jobs too, and recently landed at La Liga, James Rodríguez with lot of fans from his Facebook Fanpage. Neymar Jr is on the track to be the heir and probably achieve 2 megacracks as soon as he made some campaign in Spanish or Asian markets . In fact, it´s surprising how Welsh , French and Uruguayan get even a step below the Spanish. Cristiano is the absolute leader. His profile was managed by NIKE, at least initially, but he includes personal and brands contents. 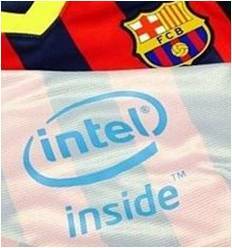 I don´t think Messi is going to start tweeting at this point. 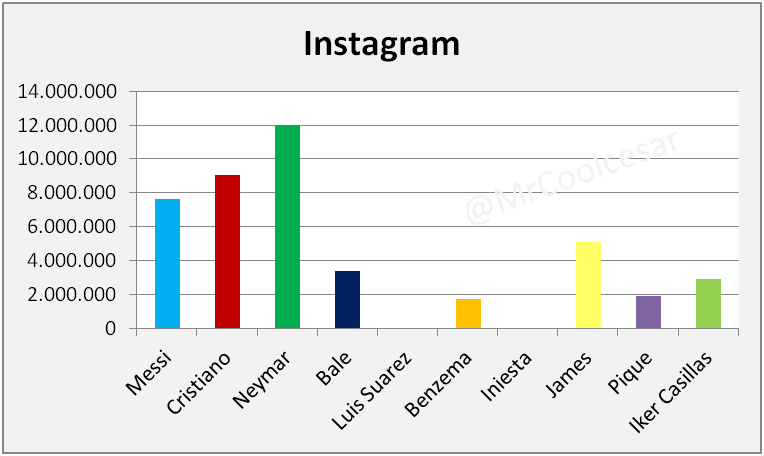 Neymar stands out, and also Iniesta and Piqué; they have really active accounts and made a good use of them, mixing personal, professional and branded content. Really close. Cristiano celebrated 100 M fans a few days ago. 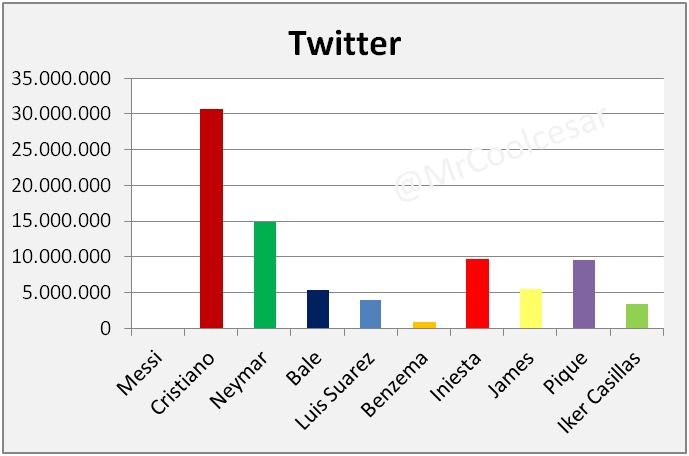 Neymar keeps in a medium position and the rest of player are in a similar level, with Iniesta and Iker fighting for the 3rd position. Lot of work for Luis Suárez… as soon as he could play and post he´ll rise. Instagram bring us the goal for brazilian, accustommed to selfies with fans and friends. Barça fans lost a lot of presence without Suarez and Iniesta. Asian Social Networks. Tencen Weibo. I´ve only found official link from Gerard Piqué´s website with more than 3,1 million followers. 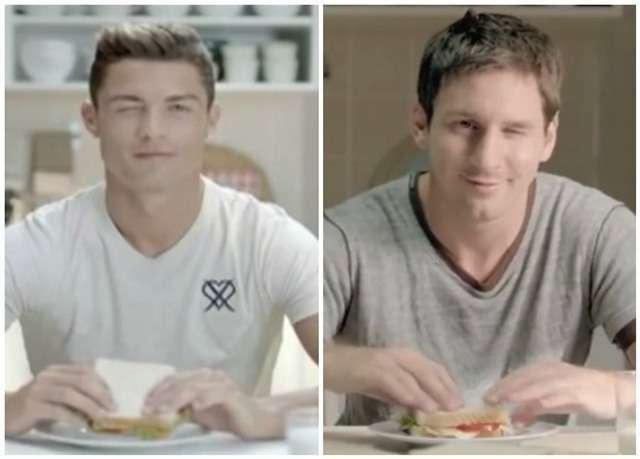 Messi and Cristiano also have profiles but you can only find them with Google or at the own network. They should include this links in official websites. 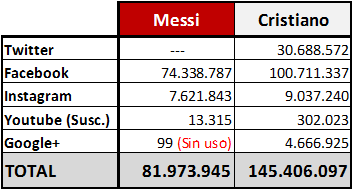 This is the one where Argentine beats Portuguese, 20 M Vs 11,5 M.
I couldn´t find others profiles - baidu or similar. All of them have their own web, except Gareth Bale. I miss some more languages… considering the few redactional content (mainly photos and videos) it doesn´t cost too much offer the opportunity to Chinese, Japanese, Indian or even, French, German, Russian or Portuguese / Brazilians. We can say that second row players have lots of work to create a strong and solid personal brand. Today online enviroment and social networks are great communication tools with a huge fans engagement, so you need to pay attention on them. (Español) Programa Patrocinio Navidad del Ayuntamiento Madrid. Árboles, pista hielo, mapping cibeles, etc. Muchas gracias, me encantan los datos. Y coincido contigo, como tu pusiste, los segundas espadas o terceras incluso necesitan empujar fuerte. La apuesta del Madrid por Bale, no fue muy buena en cuanto a imagen, pero sí deportiva. El Barca, con Neymar obtuvo ambas. Me parece que, ambos equipos eligieron bien. El Madrid este último año, parece que más que deportivamente se enfocó a expandir la imagen con James, Navas y Chicharito. Aunque, lo que me mete ruido, es que siguen expandiendo su imagen en América a la cual tiene conquistada desde hace mucho y no en Asia donde se ha visto que es donde pueden crecer. Gracias Gerardo. 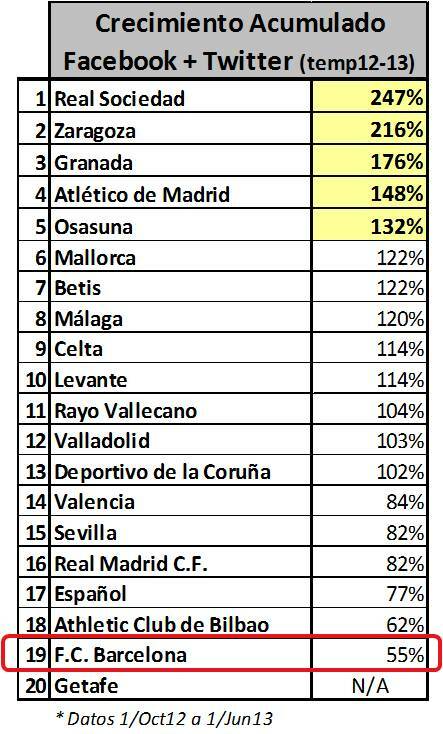 En lo deportivo en efecto creo que ambos están llamados a ser los siguientes en pelear por títulos individuales (Bale menos porque con Selección poco podrá destacar). Sin duda la apuesta del Madrid ha sido por crecer en fans americanos. Lo de Chicharito fue una casualidad, mas que una apuesta. No lo creo a corto plazo pero en algún momento llegarán a tener un jugador de USA, Emiratos, China o Japón para ganar fans.